From the 1890s until 1909, Clay County primarily built timber bridges. In 1910, though, the county secured plans for steel spans from the Nebraska State Engineer and began to include steel bridge construction in its annual contracts. After discovering poor workmanship and fraud on its steel bridges two years later, however, the board turned to the state engineer to design its first concrete arch bridge. During the 1910s and 1920s, Clay County relied exclusively on the state for plans for both steel and concrete spans. Although the county board continued to accept bids on and even build steel bridges, it consistently chose concrete over steel. Among these small-scale structures was this 50-foot arch over School Creek near Sutton. 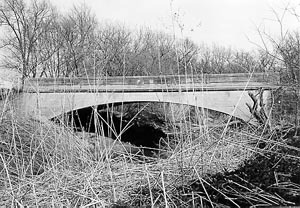 The Deering Bridge and another small arch were built by the Lincoln Construction Company in 1916, using a standard plan by the state engineer. As the longest and best remaining example among the county's concrete structures, it is significant for its early use of concrete in Nebraska.